The problem with the iPod is that while it is a great entertainment device that allows you to enjoy music, videos, and apps in the best possible way, it can only play specific types of video files, which are the files that are made specifically for iPod. In other words, if you try to put any popular video formats to your iPod and play it on your device, you will likely have the problem with it. Most popular video formats, such as MKV and XVID video files are not supported by your iPod. This is why iPod video converter software is important, because it allows you to convert any video files to iPod video files. In this way, you can play any type video on your iPod easily. Videora is a free iPod video converter that allows you to convert DVD, YouTube videos, movies, and other video files into iPod format. With this software, you can play any type of video on any type of iPod that you have, as long as it supports video playback. The software is available for Windows and Mac. WinX is a free video converter software for iPod that allows you to convert FLV, AVI, MP4, WMV, and other video files into iPod format. It features clean and simple user interface, high quality and fast video converter, and easy parameter settings. It is available only on Windows. iPod Movie Converter is an iPod video converter software that allows you to convert AVI, MPEG, VOB, RMVB, and other video files to iPod MP4 movies. The converted video is compatible with iPod and iPhone devices. It supports almost all popular video formats, and it is available only on Windows. iPod Video Converter 5.0 is an easy-to-use iPod video converter that helps you to convert popular videos to iPod, with support for all iPod devices and lifetime upgrades. It features built-in encoders and decoders, support for all video formats, high quality conversion, auto update, and iTunes-style UI. It is available only for Windows. Jodix provides a free, easy, and a complete video conversion solution for the iPod. It offers various features, including support for all video formats, easy user interface, excellent output video quality, automatic ID3 tag, and batch processing. It is available for Windows platform only. 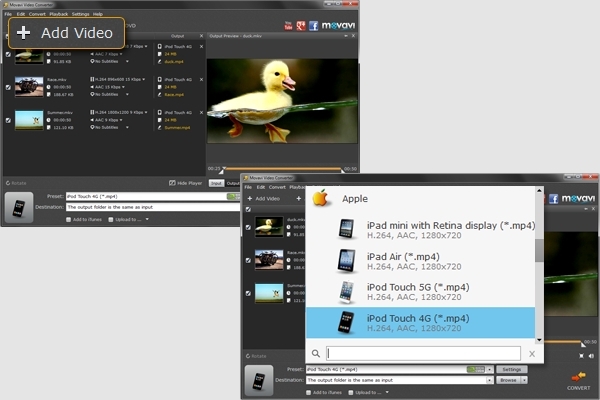 iVideoBot Pro is a video converter software that allows you to convert video files into iPod and iPhone formats. It offers various key features, including convert any videos into iPod, convert any music into iPod, select different audio tracks, trim video, join multiple video files, and high-speed conversion. This software is available only on Windows. iPod Converter 2012 is a fast and easy video converter software that allows you to convert all video files into iPod format. It features support for all available video formats, very easy-to-use interface, fast conversion speed, and excellent output quality. This software is available for Windows. Movavi Video Converter is an iPod video converter software that allows you to convert videos into iPod video files in a few clicks. The steps to convert your videos include installing the software, opening the video that you want to convert, choosing your preset, start the conversion process, and transfer your converted videos. It is available for Windows and Mac. Freez iPod Video Converter allows you to convert multiple video files into iPod video format. It features support for popular video formats, support for popular video resolutions, output video bitrate setting, and batch conversion. It is available for Windows. ImTOO iPod Movie Converter is a video converter software for iPod that allows you to convert movies and music into iPod-readable formats with high conversion speed. It features support for all iPod models, transfer output files directly to your device, convert multiple files, and convert a part of your videos or music. It is available for Windows and Mac. Factory Pro is a smart video converter software that allows you to convert all movie files into iPod, with support for all iPod models. It offers various features, including powerful video editing, special effects, fast conversion speed, convert video to pictures, and audio conversion. It is available for Windows platforms. Nidesoft allows you to convert all movie and video files that are available in popular formats into the format that your iPod can read and play. It features various audio format conversion, support crop mode setting, convert FLV format, and convert DVD. This software is available only for Windows. iPod converter software is not only available for Windows, but it is also available for Mac and other platforms as well. Some are available for free, while some others are available for a price. 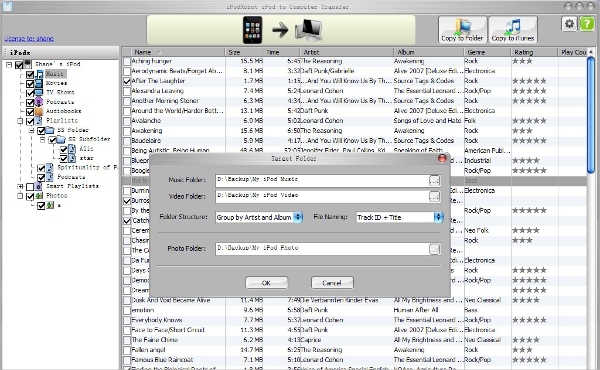 iPodRobot allows you to convert any video files and import it to iTunes, so that you can play it on your iPod devices. It offers various features, including drag and drop interface, optimized for different iPod devices, and support for most video formats. This software is only compatible with Windows. 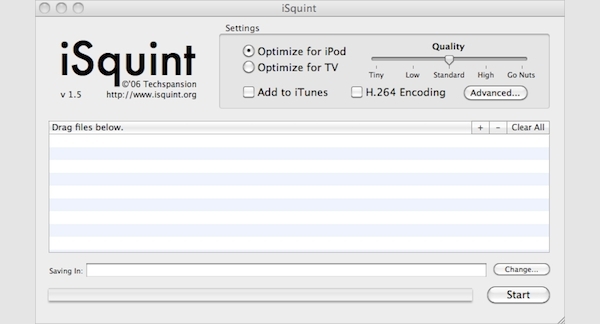 iSquint is a fast, free, and easy-to-use iPod video converter software for Mac OS X. It features fast iPod video conversion from any video format, no additional codecs, batch processing, automatic aspect ratio detection, quality slider, advanced setting drawer, and support faster conversion for multi-processor devices. BenderConverter is an online video conversion tool that allows you to convert any video files into any video format of your choice. You can use this online application to convert any video files to iPod movie format. The free version only supports for up to 100MB video conversion. Video Converter App is a video converter software for iPhone that allows you to convert any video files and play it on your iOS devices. It features transfer video files to iPod/iPhone/iPad, download and open output video, support for various formats, and compatibility with the newest iOS devices. Xilisoft iPod Video Converter is an iPod video converter software that allows you to make any video files compatible with your iPod devices. It features video to audio conversion, iPod transfer, high conversion speed, convert multiple video files at the same time, file size settings for the output files, convert any segment, and background conversion. This software is available for Microsoft Windows. What is iPod Video Converter? iPod video converter is a type of software that allows you to convert any video files into a compatible iPod video format. The problem with the iPod is that it only supports certain types of video formats, and therefore, you cannot just put any video files into it and expect it to play your videos smoothly. This is why iPod video converter is necessary. It helps you to convert your videos into the format that the iPod can read and play. Most of the iPod video converter software offers various features that can enhance the output video quality according to your preferences. How to Install iPod Video Converter? If you want to install an iPod video converter software, you need to go to the official software website and download the installation file from there. Once you have downloaded the file, you need to run the installation file on your compatible device. If the software is web-based, you don’t need to install the software in order to use it. You simply need to visit the official website of the software and start using it right away. Many people feel most comfortable playing movies and other video files on their iPod. They also use their iPod to listen to music and use some apps, since the iPod has the capability to provide the best entertainment experience for them. However, since iPod will not let you play any video files, and only let you play the supported video files that you can get from iTunes, then it will become a problem for you when you want to play a video on your iPod. This is why iPod video converter software is becoming very important since it can help you to convert any video files into the format that your iPod can read. In this way, you can play any video on your iPod without any problem.